Say where Creek? 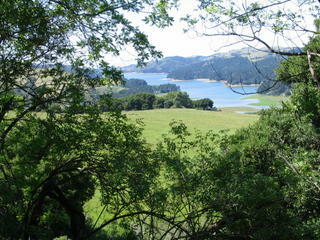 Say, the creek that flows into the super-popular fishing spot of San Pablo Reservoir. Say, the creek that remains unknown to all but a very few. Say, the invisible little creek just down on the other side of the Berkeley Hills / Tilden Park ridges. From Inspiration Point, overlooking the watershed lands, Wildcat Canyon Road winds and curves to the juncture of Bear Creek and San Pablo Dam Roads. It’s a popular meeting spot for cyclists, who congregate to discuss their adventures in Three Bears Country, or rest before tackling the big hills; they’re mostly clueless about the precious natural resource area that is just below them, out of sight and out of mind. After all, what could possibly be of interest down there? I myself have completely overlooked (viz., ignored) it for twenty years. Unnoticed, I take an enchanting path down to the little known riparian corridor. First, I sign in at Oursan Trailhead. 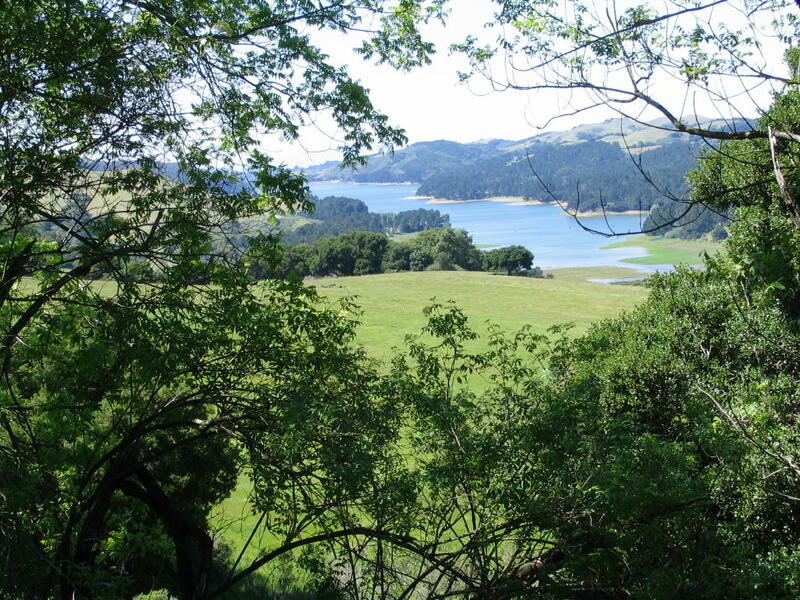 This is the water barons’ land belonging to the East Bay Municipal Utilities District (EBMUD), so you need a permit to hike. I see that in the past week about five people have signed in. I sense something special beckons in this unremote country, but what? EBMUD headquarters is practically right up the hill from where I plan to reconnoiter. Heavily trafficked San Pablo Dam Road runs nearly parallel to the creek in some parts. I hear cars rushing along and trucks grunting and belching in the EBMUD maintenance yard. What am I doing here? 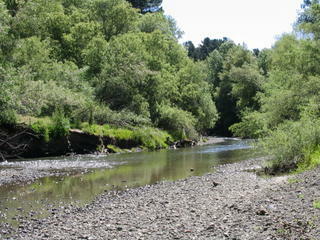 Once down in the riparian corridor, though, the change is quick and dramatic. The thick oak forest and vegetation blots out the noise. The melodious flow of water soothes my soul. Birdsong fills my heart with joy. Rays of early morning sunshine filter through pine trees. I feel like a little boy in summertime. Where on earth am I? Getting to the creek proves to be a difficult challenge. I go off-trail, a violation punishable by fine if caught, I must point out. The terrain is not the most inviting—thickets of brambles, thistles, poison oak, stinging nettle ten feet high. Now, I find myself having to get down on my belly and crawl through rotting willow branches and upturned roots—it’s an impenetrable green wall of foliage, bark, vine. It smells like summer in the Midwest. I proceed as though doing a penance. Only Tomdog would do this. Nowhere to go but on my belly, following deer trails, trusting my instinct. I’ve got my daypack on, camera and binos strapped to my chest. It’s awkward. I persevere. Soon I emerge, scratched and welty, into a bright and unexpected world. This cannot be. . .I’m too close to the highway, to civilization, for it to hold any secrets, joys , mysteries and magic of “real” nature. Yet, I feel transported to another realm, to a place very near the unnatural world, but paradoxically existing as a pure and natural slice of paradise far removed from all signs of human incursion or presence. Does such unexpected beauty make sense, I wonder? Hell, no—so nothing to do but revel silently in it. 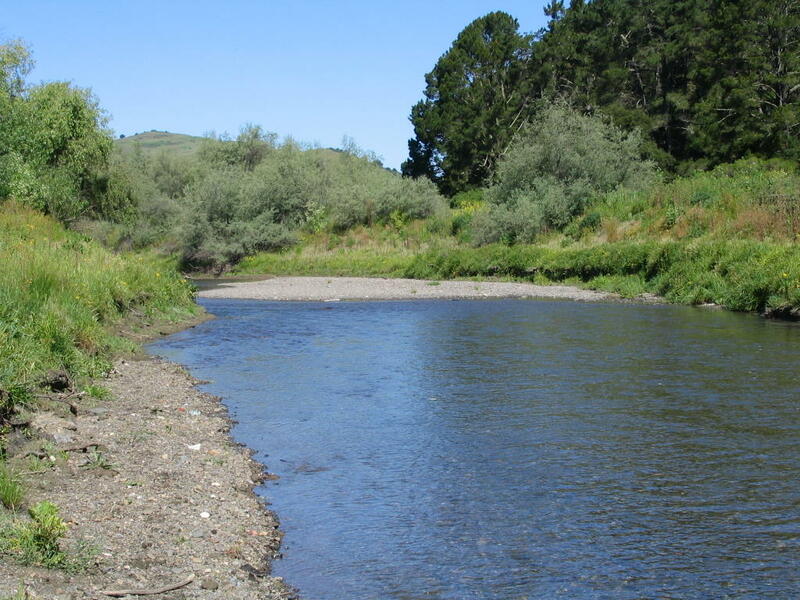 This part of San Pablo Creek is really “nothing more” than perhaps a mile of broad, meandering water, a big burbling creek elbow-bending its way through a big green scrub meadow. It reminds me of Indiana or Oregon. No, there aren’t any boulders lining the banks, no spectacular outcrops, no bedrock channels to swoosh the water through. This is “nothing more” than a country “crick” with gravel and sand bars, thick streamside vegetation, abundant and colorful wildflowers, and hidden views of lazy water flowing to its humble destination—San Pablo Reservoir. I approach the sweet, clear, and surprisingly bracing water, splashing it on the stinging nettle welts all over my arms and legs. (Yeah, I’m in shorts.) Suddenly, I hear a helicopter and quickly duck for cover. Not only is it illegal to be off-trail on EBMUD land, it’s doubly illegal to make contact of any kind with the water. The helicopter passes uneventfully. That’s the last I see or hear of one. Now, it’s just me and the animals. I admire the flat-out beautiful scene. . .deeply appreciating this little secret, yet another “discovery”, a gem of a place, right in my back yard, overlooked for years, until just now. I remain motionless, reverent, entranced by the myriad calls of birds. This place is a teeming aviary. I look up, see many high fliers, i ncluding nestling pairs of herons retreating to tall pines, geese and ducks shooting across the blue firmament, encircling vultures and hawks. I close my eyes and sit back. Oh, how I wish I knew each little bird by heart, understood her song, knew her name. (I ain’t no ornthologst, just a “word botcher”!) Then I think of Whitman’s proscription about not knowing too much scientific detail about the natural world; tis far better to admire and enjoy than to it is to catalog and identify. Now, I’m drawn to a fine sighting downstream of a big herd of deer—a buck, a couple of does and some fawns, maybe eight of them, frolicking and browsing, now swimming! I engage them through my binoculars. I’m thoroughly enjoying watching them thoroughly enjoy their swim! The fawns get out several times, as do their doting mothers. Then the little Bambis decide they’re not finished, and go on splashing back in for more. Dutifully , Mama Deer follows. This goes on and on, until she's had enough and then spends the next few minutes grazing on something delicious, no doubt, before the lot of them hightail it into the brush. I, too, am ready for a swim and a bite to eat! Where, I wonder, is skulking lioness? Things are very wild-seeming in this insular reality; if she appears, I won’t be surprised. I’m half-expecting to see a fox, a skunk, a weasel, a bobcat, a coyote. I hear snapping and crackling in the brush behind me. I jump up, just in time to see more deer peeking through at me, seeking their water source. Please forgive me, little deer, if I am momentarily disturbing your day. I know, I am just a stinking and trespassing human. . .maybe the first you’ve ever seen? I round a bend to find a secluded pool to dip in. By now the day is blasting hot for early May. Aaah, such refreshing water! I soak for several minutes, all along feeling guilty and skittish as a deer for fear of being caught where I’m not supposed to be. But nothing to worry about. The EBMUD men, only a few hundred yards up the hillside, might as well be a few thousand feet away. The road may as well not exist. Judging by the lack of beer cans, cigarette butts, candy bar wrappers, and footprints, I suspect not many, if any, make it to this spot. Oh, yeah, I keep forgetting: it’s illegal to be here. But so what! I will not be denied my private paradise. I wish I could share this spot with everyone. Alas, you will have to be content to experience it in writing and see it in the photographs. That is, unless you want to take your chances on getting caught, or really have a burning desire to brave the poison oak and the stinging nettle. Then, you too can see and appreciate this unheralded place on its own simple, down to earth terms. Say Where Creek? 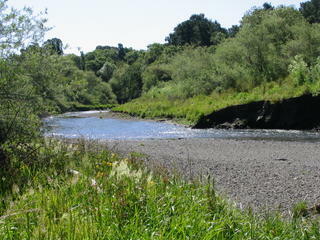 Say San Pablo Creek. See what I mean.